From simple and casual, to the most extravagant of weddings, Crackerjack Entertainment will help you customize your wedding day to be exactly what you envision. Special concerns or arrangements? Not a problem! We'll work together with you to develop the perfect plan that best fulfills your concerns, needs, and wishes! Let's face it…Business groups, big or small, need to be entertained and we will be happy to discuss your organization's needs and budgets to make your event a success. 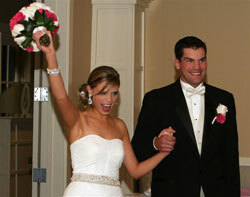 We will work closely with your event planner to ensure everything goes as planned. Something else? Birthday, anniversary, reunion, cookout, or retirement…maybe you just want a group over to the house and want someone else to worry about the music? No problem! Call us to discuss exactly what you’re looking for and we will be happy to lead you in the right direction.